Q: What are the highlights of the IIRC Integrated Report 2017? US Integrated Reporting Community in the United States. Vijith: In Sri Lanka integrated reporting has moved past the breakthrough phase and is firmly in the implementation stage. The market was sensitised very early as we participated in the discussions that preceded the release of the International Integrated Reporting Framework or ‘<IR> Framework’ in December 2013. Currently we are working in partnership with the IIRC and other stakeholders on mainstreaming integrated reporting in the Middle East. It kicked off last December 2017 with a panel discussion in Dubai on the relevance of integrated reporting in the Middle East. 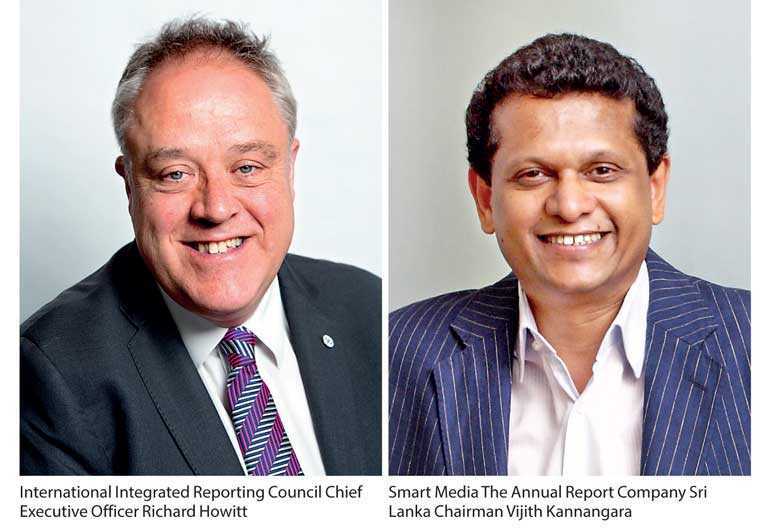 The Chairman – Middle East Investor Relations Association, Chief Executive Officer – International Integrated Reporting Council and Chairman – Smart Media The Annual Report Company were the panellists. Q: How would you define an integrated report? Richard: Integrated reporting is closely connected to integrated thinking. An integrated report is a concise communication about how an organisation’s strategy, governance, performance and prospects, in the context of its operating environment, lead to the creation of value. Value creation has a special significance in integrated reporting. It is about creating value for the organisation as well as creating value for its stakeholders in the short, medium and long-term. Vijith: Integrated reporting also cuts across other guidelines and standards, leading to better connectivity of information. For example, integrated thinking provides context to sustainability performance so that it ceases to be considered in isolation. Q: What do organisations find challenging about the preparation of an integrated report? Richard: Through our global consultation we have found that the concepts of integrated reporting are widely accepted and embraced. The IIRC is now focusing on improving the implementation of integrated reporting – especially in key areas such as the multiple capitals approach, connectivity of information and integrated thinking. In producing our own Integrated Report 2017 we have found that it is truly a joint effort requiring collaboration across the whole organisation as well as the application of the board’s collective mind. This last aspect could be a challenge for some organisations. An integrated report should include a statement from those charged with governance to acknowledge or explain their role in its preparation. This would also cover issues traditionally considered ‘non-financial’ that are strategically relevant and having a management information system to monitor them. Vijith: The concept of value creation and capital formation, particularly the off-balance sheet capitals, can be difficult to understand. It is not always seen as a natural part of the business process, despite the relevance of multiple types of capital. A part of the problem is the absence of clear metrics for quantifying these capitals and hence, the reliance on proxy indicators. So organisations can be hesitant in attempting an integrated report. Our advice has been that the transition to integrated reporting is an evolutionary process and many issues get ironed out along the way. It begins with the first step, no different from any other journey. Q: What are ‘the capitals’ in the context of integrated reporting? Richard: The capitals are stores of value. They are continuously increased, decreased or transformed through the activities of the organisation. In the <IR> Framework the capitals are categorised as financial, manufactured, intellectual, human, social and relationship, and natural. But, as clearly stated in the <IR> Framework, organisations preparing an integrated report are not required to adopt this categorisation and may use a different approach that best suits them. Vijith: That last point is very valid. However, we see many organisations slavishly following the ones in the <IR> Framework and end up getting stuck when it comes to connecting stakeholders and materiality with their story on value creation and capital formation. Our approach to value creation and capital formation evolved long before the term ‘integrated reporting’ was introduced. Back in year 2000 we introduced the concept of ‘customer capital’. We defined it as the present value of customer relationships nurtured over the years, while recognising their depth and width as well as the potential that could be unleashed to create new business opportunities. One could look at the value that a business delivers to its stakeholder groups as being the ‘sustainability’ side of the story. But that is only part of the story. These stakeholders in turn become valuable to the business in driving its own future earnings to create ‘financial capital’. So, in our integrated reporting methodology these stakeholders also become forms of capital. Richard: When an organisation actively considers the relationships between its various operating and functional units and the capitals that it uses or affects you have integrated thinking. Integrated thinking leads to integrated decision-making and actions that consider the creation of value over the short, medium and long term. Integrated thinking takes into account the connectivity and interdependencies between several factors that affect an organisation’s ability to create value over time. As you can imagine senior management support is essential for this to work. Mature integrated thinking can lead to better decision making within the organisation and this is brought out through the ‘connectivity of information’ in an integrated report. Vijith: At a MENA Roadshow in Dubai earlier this year Smart Media explained to investor relations professionals and other capital market stakeholders in the region how integrated reporting reveals the ‘hidden worth of a business’. It was about how an organisation identifies, develops and anchors down its multiple forms of capital. If the story is told well with the right KPIs, told consistently from year-to-year and told in the context of the changing operating environment, management challenges and strategy it becomes a story that is of interest to stakeholders - particularly providers of financial capital. And in telling this story well, the organisation will find that it is already practicing integrated thinking in a meaningful way. Q: An integrated report requires the documentation of stakeholder relationships. Why? Richard: Integrated reporting creates the conditions for trusted relationships between organisations and their stakeholders through increased transparency. The documentation of stakeholder relationships provides an indication of how stakeholder needs and interests are being addressed. In short, stakeholder identification, materiality determination and engagement are part and parcel of corporate governance and strategy. All these are of prime interest to providers of financial capital – particularly the institutional investor community. Vijith: Local and regional markets have articulated the need for foreign direct investment in documents such as their 2030 Vision. As Richard mentioned just now, an integrated report is a critical piece of corporate communication to investors because it provides a concise and comprehensive story of the organisation. Q: Materiality is considered one of the Guiding Principles of the <IR> Framework. What is its role in an integrated report? Richard: Materiality is important because it is central to strategy formulation and hence, performance. An integrated report should disclose information about matters that substantively affect the organisation’s ability to create value over the short, medium and long term. Those that may destroy value are termed risks; those that may create value are termed opportunities. Vijith: So it boils down to determining the importance of an aspect in terms of risks and opportunities. Importance is determined in terms of relevance, potential severity of impact and likelihood of occurrence. Materiality is a principle that report preparers in Sri Lanka as well as in several other countries find confusing because there are differing definitions coming from other frameworks and standards. So we see ‘hybrid’ definitions and approaches in practice! Q: Why does an integrated report need to include a strategic focus and future orientation? Richard: An integrated report should provide insight into the organisation’s strategy, especially in terms of how that strategy relates to its ability to create value in the short, medium and long term. Providers of financial capital especially will be keen to learn of the strategy’s use of and effects on the capitals. So this is an important part of integrated reporting. Vijith: This is an area that is under-reported in the Sri Lankan and Middle East markets. In many cases it is a fear of giving away too much to competitors. In contrast the IIRC Integrated Report 2017 is a good example of how strategic focus and future orientation can be applied practically. The report looks at the journey of IIRC through a series of strategic phases, with each phase spelling out strategic themes or objectives. There is also a clear articulation of how governance connects with strategy. Even the best of strategies need good governance in place to be effective. Q: How do report preparers reconcile between the seemingly opposing requirements of conciseness and completeness? Richard: There’s a natural tension between conciseness and completeness. Conciseness is often overlooked. An integrated report must also be complete. A complete integrated report includes all information that is material to the value creation story, both positive and negative, while meeting regulatory requirements on disclosure. Having said that, we are adamant that integrated reports need to be accessible and usable – this means communicating concisely what the key issues are. Vijith: Report preparers often take the easy path and subscribe to the ‘more is better’ mantra. It fits well as it also supports the evaluation criteria adopted by awarding bodies that recognise excellence in annual reporting while recognising only disclosures appearing in print and ignoring any digital channel. So, we find organisations creating encyclopaedic annual reports in print that is all things to everyone. But, these blockbusters serve no one except perhaps a select few. This is why we advocate a concise report in print and an online HTML version for additional details. One could also prepare annual snapshots across any medium for any device to effectively communicate with specific stakeholder groups. This is also where regulatory acceptance of online HTML annual reports would help. Q: How well does integrated reporting align with global trends? Richard: An integrated report should have a strategic focus. It means anticipating future global trends and being able to respond to them so that the organisation continues to remain relevant to the market needs of today and tomorrow. This begins with a scan of the operating environment, both internal and external; identifying opportunities and risks; assessing their materiality and formulating strategies to address them. In our Integrated Report 2017 we have identified seven significant global trends and have explained how integrated reporting aligns. Vijith: Aligning with global trends also calls for making effective use of technology to communicate with stakeholders. We help report preparers tell their value creation stories using the channels and formats that are best suited to each stakeholder group. This is something we’ve been doing for a while. Our first online annual report was published for a report preparer as far back as 1999 while our first video snapshot was released in 2011. Q: Among the content elements of an integrated report the business model is an area that report preparers wrestle with. Any advice? Richard: Many report preparers see the business model as the most important element of an integrated report. But there is a tendency for formulaic business model discussions. This is a problem because such discussions lack insight on the specific organisation. Vijith: The value creation model is an area that report preparers could improve upon. Many seem to be lost and just mimic what is seen in the <IR> Framework without checking for relevance to what is said in their integrated reports. It stems from playing it safe to win awards at corporate reporting competitions when box ticking becomes the primary focus. We have developed a unique value creation model based on a ‘results chain’ underpinned by the stakeholder and materiality analysis. It is an uncomplicated flow diagram that seamlessly provides context to the multiple capitals while showing value creation as a cascade – the short, medium and long term being likened to outputs, outcomes and impact respectively. Q: What kind of support is required for integrated reporting globally? Richard: The message from the International Federation of Accountants (IFAC) that ‘integrated reporting is the future of corporate reporting’ is a major breakthrough within the accountancy profession. Already there are corporate governance codes referencing or aligning with integrated reporting in nine countries; stock exchange adoption or encouragement in six countries; and government body encouragement in six countries. But there is room for greater endorsement for us to scale up. Institutional investors are key in driving reform in corporate reporting. Awarding bodies too could do more to sharpen their evaluation criteria. And of course, within the organisation itself, senior management support is crucial for the production of an effective integrated report. Vijith: Many report preparers opt not to be innovative in how they craft and communicate their value creation story for fear of losing out on awards that could provide them with much positive publicity. But stifling innovation in this way benefits no one. Digital technology is leaping ahead as we speak and there’s really no need to produce voluminous printed annual reports when there are many more effective ways to communicate with stakeholder groups. In this context the IIRC Integrated Report 2017 is a prime example – it is available in concise print, a more detailed online HTML and downloadable PDF. An executive summary and video are also available for mobile devices.